I just can't believe summer is winding down already, can you? This is always such a sad time of year for me. I wait so long for summer to get here, and it's always over in a blink of an eye. It is time for summer's last hurrah as my garden is in all of it's glory now. All the hot, bright summer perennials are in bloom and the annuals have finally grown and blooming away! In the sun garden, Rudebekias, Purple Coneflower, Marigolds and a very large Viburnum are the stars! I had a friend come and visit me yesterday and she was awestruck by how large my white Viburnum bush is. She had just purchased one herself and now she was concerned about where she planted it because she feared it would become too big for that area. I replied "I really don't know. Everything seems to grow twice as big for me than the label says it should". It is a beauty. It is definitely the first thing that catches your eye when you walk into the garden. Here is a close up of one of it's blooms. The best part about this bush is that it changes colors as the season progresses. The blooms dry right on the branches and provide winter interest as well. The butterflies have been loving my garden this year. They are very attracted to the Purple Coneflower. The birds love it when the Purple Coneflower go to seed too. But you have to watch it if you decide to let this plant go to seed because it will take over your garden quickly. I LOVE, LOVE, LOVE Black Eyed Susans. It has to be my favorite garden flower. Their blooms are gorgeous and long lasting. They are so hardy. Nothing kills them. And the best part is, they don't get knocked over by summer storms. This purple plant was one of my favorites last year, but this year it got knocked over by summer storms and doesn't look near as good. I tried to stake it back up, but it never looks the same. It is a variety of Salvia that is very long blooming...which is very rare for perennials. My husband got up on the roof for me to take these aerial views of the yard. 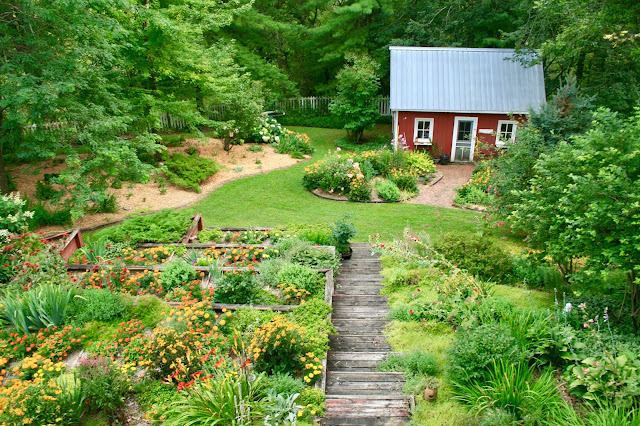 The garden on the left is the one I just renovated this year. I'm still working on the garden near the shed. I'm about half way through it. I'm not sure if I'll be able to finish it before winter, but I will keep plugging along at it. Most of the orange color you see are marigolds. I bought several different this year and mixed them all together. 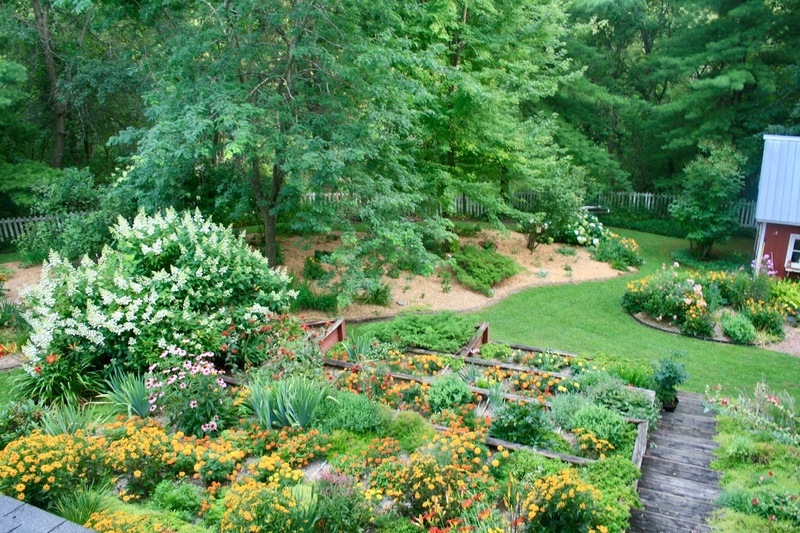 I re-did this garden last year, and used the marigolds to fill in the bare spots until the perennials got bigger. 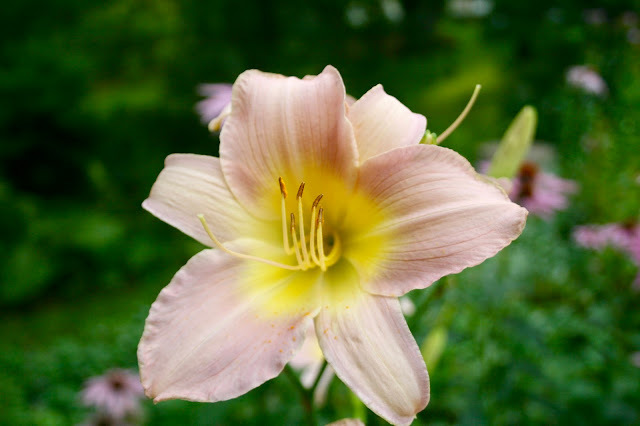 I had a pretty pink daylily open up recently. I just love it's pretty yellow center. Tall Phlox really overtook my entire yard. I decided I really don't want much of this plant in my yard anymore. It's too invasive, it grows too tall for me, and it gets powdery mildew...even the varieties that say will not get powdery mildew: so I have been digging and pulling it up like crazy! I have however left just a few plants here and there, but I will be watching them to make sure they don't take over again! 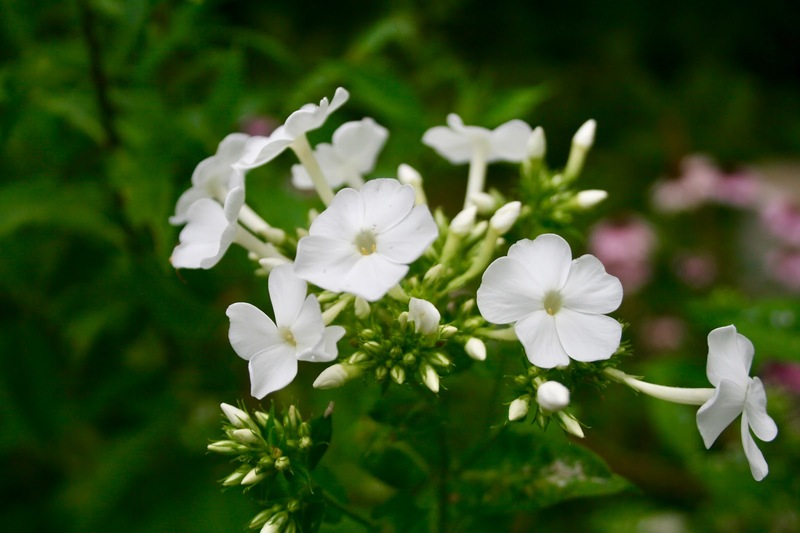 Here is a pretty white Tall Phlox. A common purple Tall Phlox. And one of my personal favorites: a hot coral Tall Phlox. 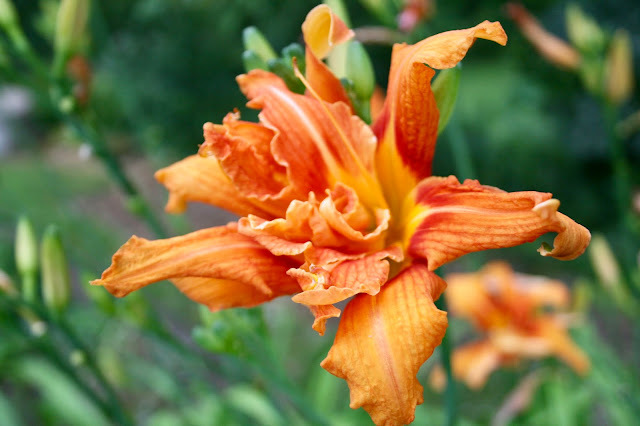 I low to use the wild orange day lilies in difficult spots where other plants might not be able to grow. They make a nice ground cover for steep banks. 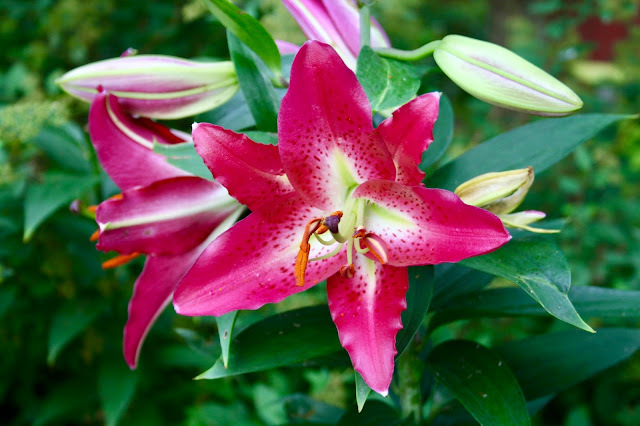 Isn't this Star Gazer Lily beautiful! I wish you could smell it! It's so heavenly! This year, for the first time ever, I lost every single impatient I planted. I bought probably six flats of impatience and they all died! It didn't matter where I planted them...in a container, the ground, a planter, they all wilted and died. I was so unhappy! I have no idea what happened. I've always successfully grown impatiens before. So I had to re buy all my annuals. 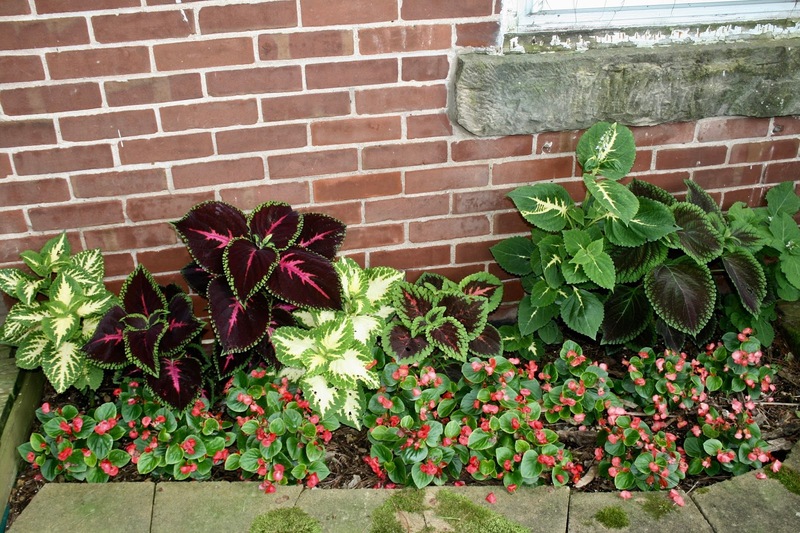 This time I purchased Coleus and Begonias and they grew beautifully. I was so happy with the results, I decided to this every year from now on. I couldn't believe how huge the Coleus grew! I loved all the different colors too. This is my view when I wake up in the morning. It's the very first thing I see! How can I not wake up in a great mood when I look out my window and see this? Seeing this is amazing , Amy!! I don't know you have time for anything else!! Thanks Jodie! You're right. I went back to work for six after the kids went to college and the garden went to ruin! I've been restoring it for the past two years, I figure in about two more years I'll have the garden back to it's original glory. You are so lucky to be able to enjoy this view every day! Absolutely gorgeous! Yes it's hard to believe Summer is coming to an end, and tomorrow the kids in our area are going back to school...Not looking forward to that! I love having the kids home! Aww, thanks Elli! I always hated sending the kids back to school too. Looking back, I would have homeschooled them if I could do it all over again. 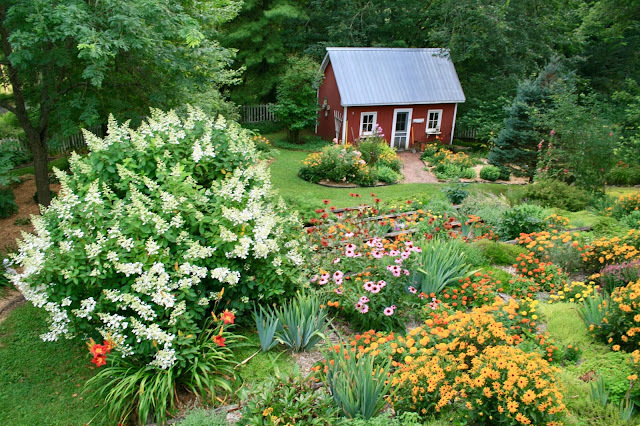 Your yard is a botanical wonderland. Thank you for sharing with us. We have not been able to buy impatiens in my area for two years now. I heard that they were suffering from some kind of mildew. However the larger New Guinea impatiens are still selling and they seem unaffected. And this year, my daughter bought a species called sun-impatiens, that actually like being in full sun. I wouldn't give up on them just yet. Julie, I read the same thing online. 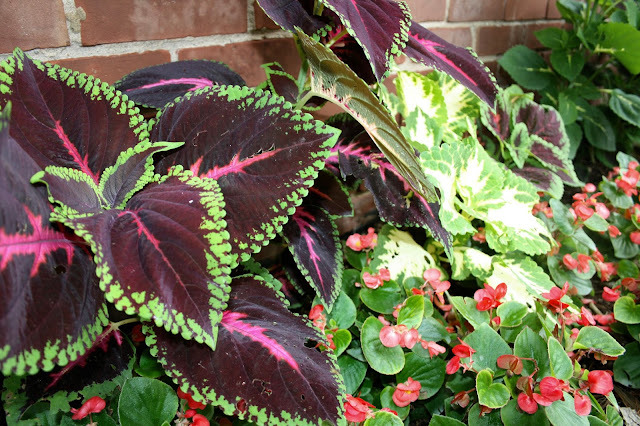 After my impatiens died, I bought coleus and begonias and they have performed to much better than impatiens I will plant them every year now. I could not believe how huge my coleus grew! I visit your garden online often, it gives me inspiration. And this morning, I bought a viburnum after seeing your gorgeous one. That's awesome! You will love it! It's the perfect bush!